Learn Chinese: With 2000 Hanzi you will master the Chinese language. ...... Download and start immediately. 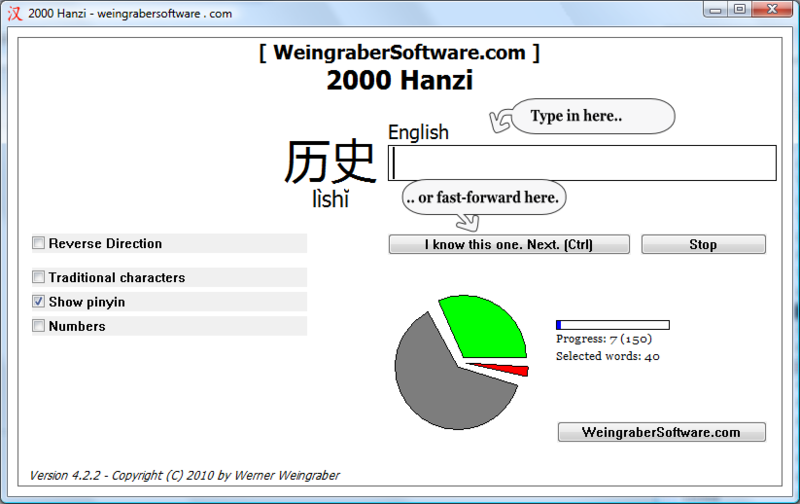 Learn Chinese at your own pace: 2000 Hanzi takes care of the details and adjusts to your speed. If your brain is the size of a Diesel engine, you can do it all in a day. If you can spare no more than five minutes in the evening - you can do that too. 2000 Hanzi remembers what you learned last, what you already know, and which words need extra practice. 2000 Hanzi will keep all the counts for you. Just press the Start-Button and off you go. Never worry about repetitions or introducing new words, 2000 Hanzi does that for you. Just enjoy learning Chinese. Digger 2000 - Just new DIGGER for new Millennium! eClean 2000 removes >>> from emails leaving only legible text. A suite of clocks and other timekeeping tools, timezone clocks, alarms and more. Worm 2000 is a remake of the classic arcade python-style game. StormWindow provides desktop and system security for a shared Windows 2000 PC. Qweas is providing links to 2000 Hanzi 4.2.2 as a courtesy, and makes no representations regarding 2000 Hanzi or any other applications or any information related thereto. Any questions, complaints or claims regarding this application 2000 Hanzi 4.2.2 must be directed to the appropriate software vendor. You may click the publisher link of 2000 Hanzi on the top of this page to get more details about the vendor.